The “Family Feud” will be airing a night-time version with celebrity families, hosted by “Today” show weatherman, Al Roker, according to news reported by BuzzerBlog starting June 24th on NBC. 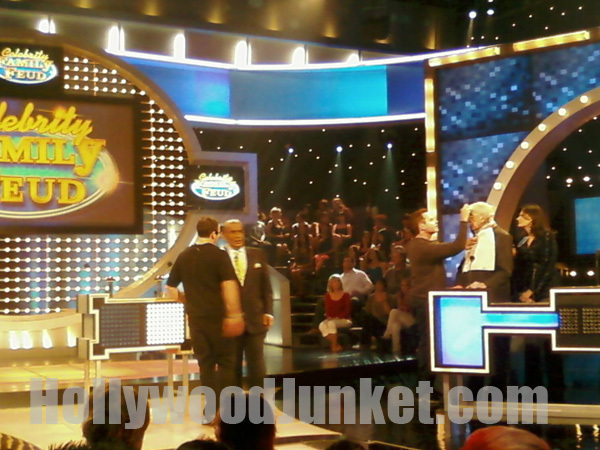 HOLLYWOOD JUNKET was on set and witnessed some of the celebrities viewers at home will see playing one of America’s longest-running game show. First of all, Al Roker is a terrific, and bubbly game show host. He is genuinely his upbeat and cheerful self when the cameras are rolling, but more important, when the cameras are not rolling. He jokingly apologized to audiences seated facing his backside, for the unflattering view. First and foremost, the format of the celebrity edition of “Family Feud” is slightly different. Four families play in one show taping. The two winning families from both games go up against each other. The family that wins that game, goes on to the final showcase showdown where they have a chance to win $50,000 for their chosen charity. In one episode, American Choppers competes against the Christopher Knight (a.k.a. Peter Brady) family which included his wife, Adrianne Curry (first “Top Model” winner), her mother , and her best friend, along with Knight’s brother. Knight joked with American Chopper Patriarch, Paul Teutul Sr., who is easily identifiable by his big mustache. Knight wore a fake black mustache and mocked Teutul while playing against him in the head-to-head question. Tuetul’s family included two sons and two shop employees. Other families we saw battling against each other were: Ed McMahon family vs. Tiki Barber family; Deion Sanders family vs. Kardashian family; and Corbin Bernsen family vs. Margaret Cho family. Above: Ed McMahon (far right) gets makeup for the next round! Aside from being the host of “Star Search”, he’s most famous for being Johnny Carson’s (of the “Tonight Show”) cheerful sidekick, Ed McMahon was greeted by Al Roker who said, “we’ve hear a lot on the news. Are you okay?” McMahon responded with a simple, “yes”. McMahon was wearing a neck brace and was helped onto to the stage by his son and wife. His family included his wife, grand daughter, and son. They competed against former NFL Giants star, and correspondent for NBC News’ “Today” Tiki Barber and family that included wife Candy, mother and children. Some humorous responses from McMahon’s side (they were 100% serious) to surveyed questions that one would only hear from people who live in Los Angeles, were: “liposuction” for what men do when they notice they have gained stomach fat, and “credit card” for something a husband wouldn’t want to see in his wife’s hand while she’s angry at him. In their defense, that last one could really do some serious damage! As it was announced on the show, the only athlete to play in both a Super Bowl and a World Series, Deion Sanders competed with wife, Pilar, son, Deion Jr., daughter Deiondra, and his mother. If the names are not egotistical enough, the charity they played for was “Sanders Clause Foundation”, Deion’s own charity. Deion showed Pilar much affection after each of her correct answers, which by the way, were most of them. Their opponents were the Kardashian family that consisted of, Kim, step-father and former Olympics Gold winner Bruce Jenner, mother, and two sisters. One of the Producers of “Family Feud” was overheard asking if there would be a correction made when the announcer introduced Jenner’s children as his “step children”. They said “no”. Above: Bruce Jenner plays the ‘Feud with his wife (in blue) and step children, including Kim Kardashian to his right. Former “L.A. Law” and “How Much is Enough” game show host, Corbin Bernsen family vs. Margaret Cho (comedian) family. Corbin competed with wife and actress, Amanda Pays and three of their sons while their fourth and youngest son watched on the sidelines in the audience. Their opponents were Margaret Cho who brought her mother, father, stylist, and Assistant to battle. She wore bright red tights. Her father had the audience laughing when he made an example out of Roker to a response of a question regarding rudeness. I guess we know who Margaret gets her humor from! 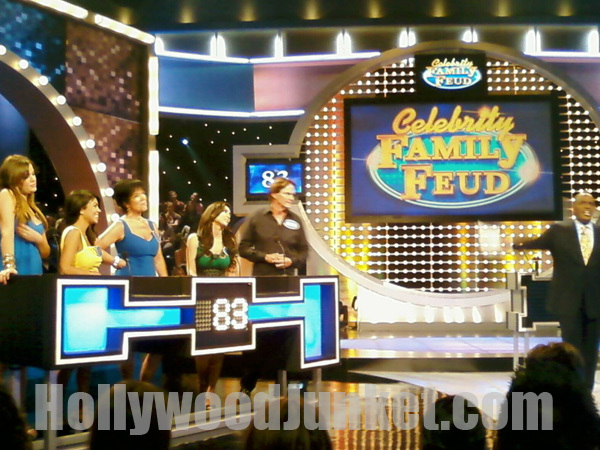 “Celebrity Family Feud” was originally to be aired starting July 1st, but has been moved up to June 24th. Word of the set is: an updated version of “The Gong Show” starts taping next weekend.